This is a dish you make when you want something satisfying and hearty and simple and delicious. This is for a night at home, when all you want to do is dinner and a Netflix movie. And so, when FIL came for a visit and requested comfort food, this was the comfortiest of comfort foods that popped into my mind. Don't break out the fancy dishes, it isn't that kind of night. Kick off your shoes and tuck in. Then sit around chatting comfortably while you take a second helping. And shh. I won't tell if you go back for a third. And the next day? Meatloaf sandwiches for lunch!! 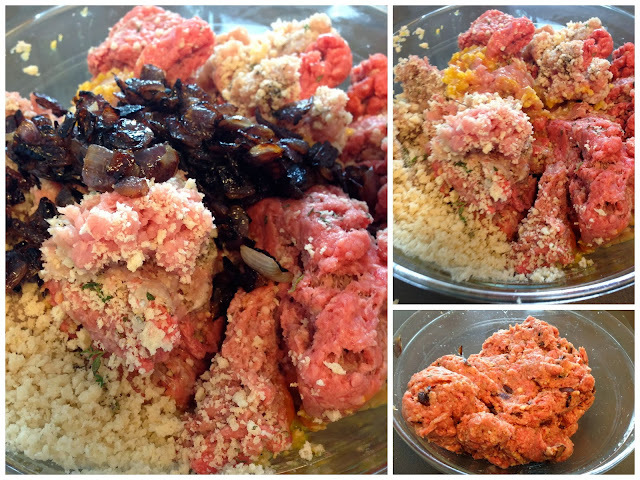 Combine all the meatloaf ingredients and mix. Pack into a 10 inch loaf pan lined with aluminum foil to mold into shape of meatloaf. On parchment lined baking sheet, turn meatloaf out onto center of ray. Brush 1/3 of the glaze over the top and sides of the meatloaf. Brush 1/3 of the glaze on the loaf. Remove from oven, brush with the rest of the glaze.